Basic breads are those that are made with a simple recipe of a few ingredients, are yeast leavened, and are usually easy for the home cook to prepare, requiring only basic bread making skills and simple pieces of kitchen equipment. Plain yeast breads include pan breads and hearth breads. Pan breads are baked in a pan or container placed on an oven rack, while hearth breads are baked on flat pans, stones, tiles, or directly on the floor of the oven. Basic breads can be prepared with refined white flour, whole-grain flour, or coarsely ground meal. Some basic breads are made with a variety of flours milled from different grains to create breads with unusual flavors or textures. Wheat flour is often added to non-wheat bread dough so that the dough will rise effectively. Description: Artisan bread refers to different types of bread that are prepared by a skilled baker and are handcrafted through each step of the process. During the preparation process, the bread artisan mixes the perfect balance of all-natural ingredients and bakes the bread using the optimum oven temperature and baking time to create a product with an excellent crumb and crust. Some varieties of artisan bread have a very light and delicate flavor while others may have a very pronounced flavor depending on the ingredients and the preparation techniques that were used. 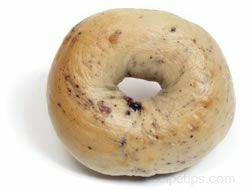 Description: A bagel is a chewy doughnut shaped yeast bread that is very popular worldwide. The bagel originated in eastern Europe where at one time it was among the most common breads in Jewish households. It is now believed that the best bagels are made in New York City bakeries from recipes and techniques brought to the United States by Jewish immigrants. Before baking, bagels are poached for a short time. This technique prevents the dough from rising any further during baking, which creates the characteristic soft and chewy texture. Many types of flour are used, but white all-purpose, unbleached or bread flour, whole-wheat, and rye flour are most often used. Some bagels are plain while others include numerous ingredients that are incorporated with the dough or used as a topping, such as cheese, onions, garlic, pieces of fruit or vegetables, seeds, herbs, spices, or coarse salt. Bagels are often sliced into two flat rings and eaten plain, toasted, or spread with cream cheese or other ingredients. 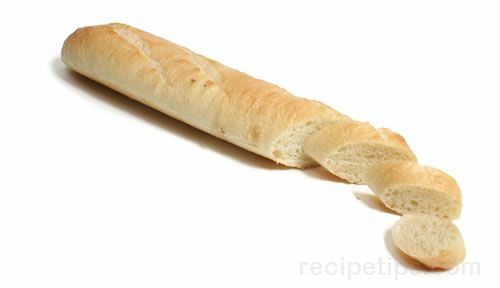 Description: A baguette is a basic type of yeast bread that originated in France. The name of this traditional French bread translates to little rod, which describes the long, thin shape that is characteristic of the loaf. A baguette is usually 1 1/2 to 2 feet in length and 3 to 4 inches in diameter. The term baguette may be used to describe a variety of breads that all have the baguette shape in common, but may originate from different countries of regions. The dough for a French baguette is usually made with wheat flour and the bread has a soft, chewy interior surrounded by a crispy, brown crust. The dough can also be used for variations in the shape of the bread including split rolls known as pistolets and a shape that resembles an ear of wheat known as a pain d'epi. 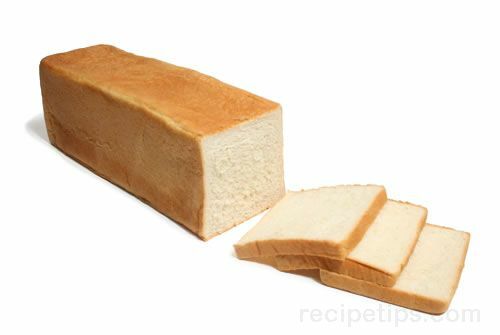 Description: A Swiss bread loaf that is an adaptation of German and French white breads. 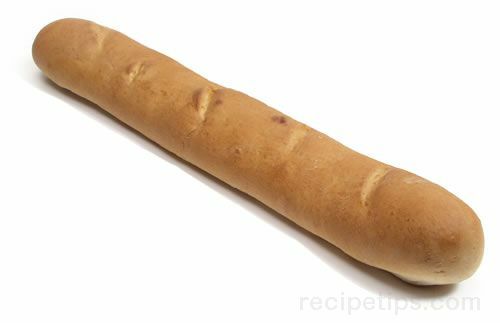 Bangeli bread has a long baguette shape, which often has several horizontal slashes across the top. The bread features a thick crust and a chewy interior similar to French bread. It is used much the same as similar white breads of German or French origin: as a sandwich bread when thinly sliced; as a bread used for toasting, topped with preserves or jellies; as a bread served with cheese and wine; and as a crusty bread that can be spread with butter or dipped in extra virgin olive oil and served as an accompaniment to a meal. 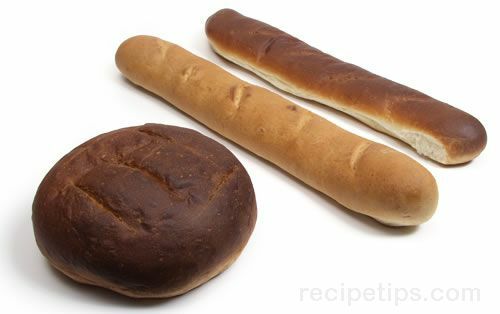 Description: A Mexican bread, made with a basic dough that is very similar to a French baguette dough. The bread has a crispy, flavorful crust and a soft, chewy crumb. 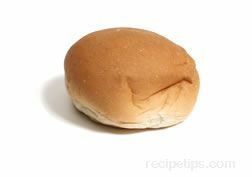 The dough is usually formed into a football shaped roll. Occasionally, the dough is scored to create three sections along the length of the football shape, in which case the bolillo is known as a telera. 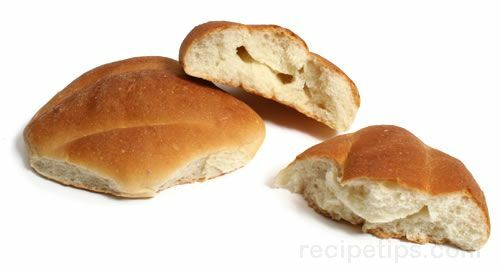 Description: A type of plain bread formed into rounded bun shape and most often split and used for a hamburger sandwich. Commercially prepared burger buns are often already split and some are occasionally topped with sesame seeds. 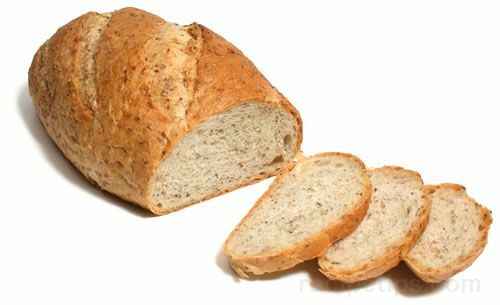 Description: A common type of bread in the British Isles and the United States in which the name refers more to the shape and style of the bread loaf than to any particular recipe. 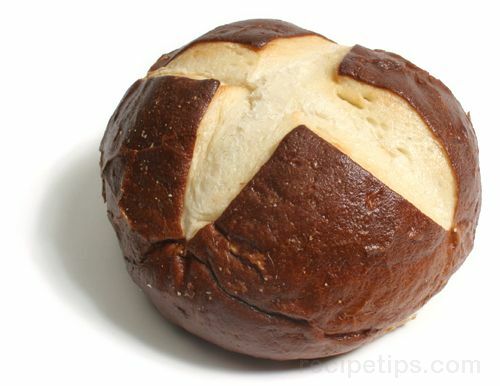 The dough is shaped into a rounded form and the top of the dough is slashed with a cross, which is the distinctive feature that identifies the loaf as Coburg bread. The bread is most often made with wheat flour (white bread flour, whole-wheat flour, or a combination of both). Occasionally, the whole-wheat flour is combined with other types of whole-grain flour to create a multigrain loaf. Description: A cottage loaf is a basic white bread that is English in origin and is unique due to its shape. The loaf is actually two round loaves - one on top of the other. The top round is smaller than the bottom round. Making a hole through the center of the top round and continuing through the bottom round welds the dough of the two rounds. A wooden dowel or a spoon handle are useful tools for creating the hole. The perimeter of each of the rounds is often slit every 2 to 3 inches, which helps the dough to expand while baking. It is thought that the unusual shape was a result of the need to be as efficient as possible with the small baking space available in the ovens of earlier times. The term cottage bread is often used to describe a variety of breads that all have the cottage shape in common. Description: Épi is a French bread that designates a shape more than a particular type of bread. The bread resembles an ear of wheat and is often made with French baguette dough or adapted from white bread recipes. Description: A type of bread very similar to a French baguette only it is smaller in size. Ficelle is a French term meaning string, and it is prepared with the same type of dough as a baguette. Like the baguette, the bread features a crispy crust and a soft, chewy crumb. The length may be about the same as a baguette, but the diameter and weight of the bread is usually about half, however some versions are shorter in length as well. Description: The French word boule means ball or round, so boule refers more to the shape of the bread than any particular type. The term boule is used to describe a variety of breads that all have the boule shape in common. A typical French boule is a hearty, country bread with a chewy crust, an open crumb, and a moderately soft interior and is baked in many different sizes. It is often made with the same type of dough as a French baguette. Description: A generic name given to a variety of Italian breads. Most are white breads that are similar to French baguette dough. Some are leavened with yeast, while others use a starter dough as a leaven, such as a biga starter. 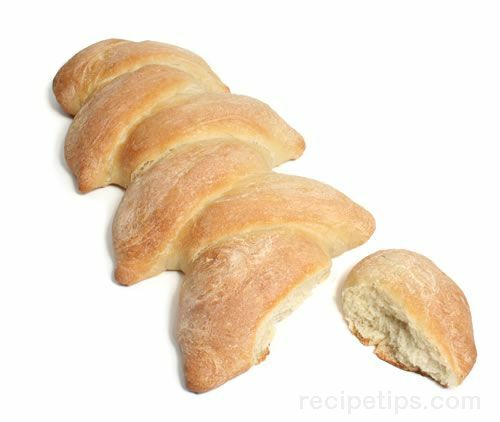 Italian bread is often formed into short, wide loaves or it may be formed into rounds and ovals. Description: A French white bread that is one of the simplest to prepare. The bread is made only with yeast, flour, water, and salt and is very similar to a French baguette recipe, but contains a little less water and yeast. The dough can be formed into any shape that is desired for baking on a flat surface or in a loaf pan. Description: A pretzel is a type of basic bread native to Germany that is easily identified by its traditional twisted knot shape that resembles two crossed arms within an oval. In much of northern Europe, this shape is often used as a symbol to signify a bakery. Pretzels are made from white flour and made into either a soft bread-like version or a hard, crisp variety. The soft pretzel is usually larger than the harder version and is often served with mustard or cheese and is eaten as a snack with beer. 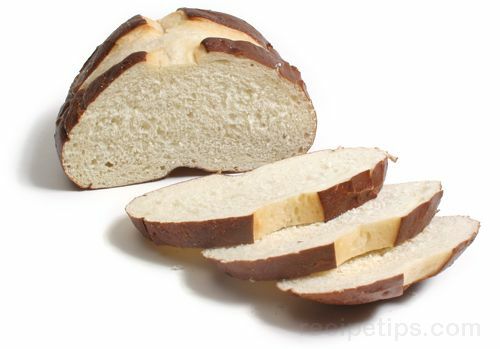 (A bread loaf made from the dough is actually known as Pretzel Bread.) The hard pretzel is made by baking it immediately after it is shaped rather than allowing it to rise a final time. 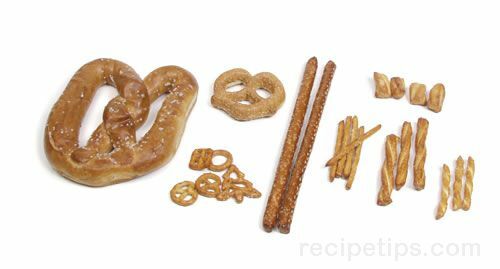 Both soft and hard pretzels are also formed into other shapes such as stick shapes of various lengths and wedge shapes. Pretzels are often topped with coarse salt before baking and occasionally other toppings are used, such as sesame seeds or poppy seeds, especially for the larger soft pretzel. Description: A type of bread named after the famous Pullman railway coach of the United States, because the shape of the bread and the shape of the railway car are similar. The bread is usually made with white flour and baked in a long rectangular pan. The Pullman loaf is most often sliced and used as a sandwich bread. 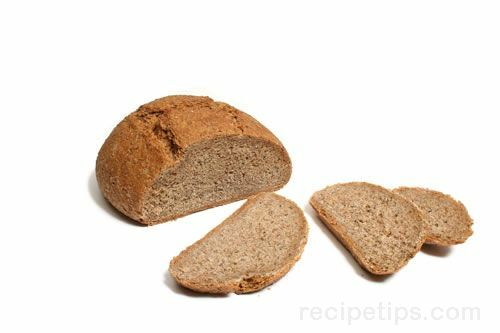 Description: A type of pumpernickel bread that is usually a bit lighter and less dense than German pumpernickel due to a higher proportion of whole-wheat flour to rye flour. Austrian pumpernickel goes well with soups and stews and is excellent for sandwiches. Description: Pumpernickel is a traditional German rye bread that is often prepared with 100% coarsely ground rye flour, which results in a heavy, dense loaf. It is occasionally prepared with some wheat flour added in order to make the loaf a bit lighter and to increase the capability of the dough to rise. 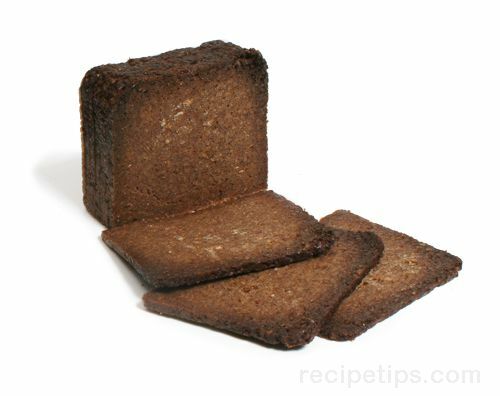 Pumpernickel is a type of kastenbrot, meaning box bread. It is steamed in an oven rather than being actually baked. Pans of boiling water are placed in the oven with the pans of dough, which are cooked with low heat for several hours. 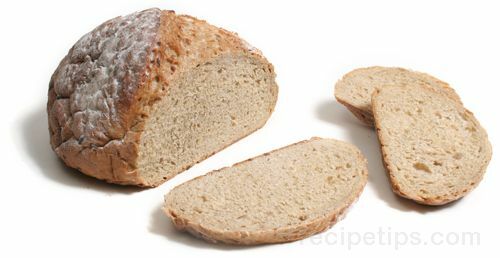 The result is bread that has a moist crumb, a solid crust, and a dark color resulting from the starch in the rye becoming caramelized during the slow steaming/baking process. 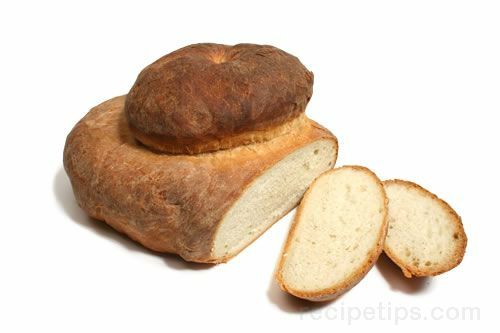 The bread is sometimes flavored with caraway seeds, as are many German breads. Pumpernickel is usually thinly sliced, and the hearty and somewhat sour flavor goes well with beer, cheese, meats, and sausages. Description: Rye flour does not contain enough of the type of protein that promotes gluten development, which allows bread to rise properly, so it is often combined with wheat flour to increase the gluten forming capability. The darkness and flavor of the loaf depends on the darkness of the rye flour and the quantity of rye flour in relation to the wheat flour. When rye flour is used alone, the result is a very heavy, dense loaf and the dough is very sticky and difficult to handle. There is a wide range of distinctly flavored breads made from rye grain. Some rye breads are made from basic yeasted doughs while others are made using a starter dough. Various rye breads include hearty German pumpernickel, crusty black breads (which are actually a gray-brown color) of Russia, Pain de Seigle of France, and lighter colored breads of Scandinavia, such as Danish rye and Swedish Limpa. 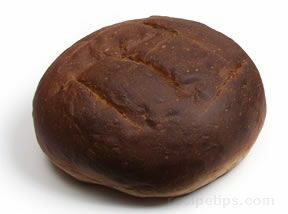 Description: A type of rye bread of German origin that is a bit heavier than many other types of rye bread. 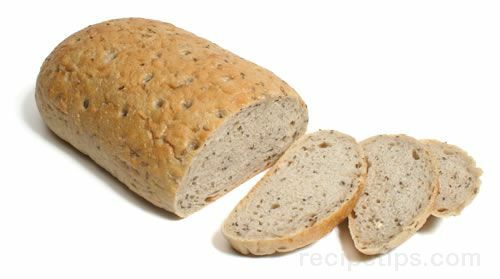 German rye usually contains a greater ratio of rye flour to wheat flour than the rye breads of Italy, Sweden, or the United States. The higher proportion of rye flour yields a loaf that is a bit denser than other rye breads, but it is not nearly as dense as pumpernickel, which may contain 100% rye flour. Description: A type of rye bread of Italian origin that is not as heavy as its northern and eastern European counterparts due to the smaller proportion of rye flour used. 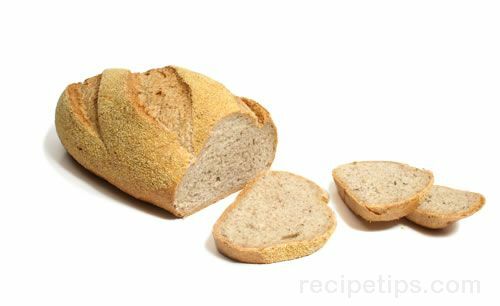 It has a lightly colored crust and crumb and is a delicious bread for slicing and using for sandwiches or for dipping in olive oil. Some recipes call for the addition of caraway seeds, which gives the bread a more pronounced flavor, reminiscent of the hearty, full-flavored rye breads of the regions where rye bread is more of a staple than it is in Italy. Description: Marble rye bread is made with a combination of rye dough and wheat dough to create a hearty flavored deli-style sandwich bread. The rye dough can be a traditional dough of rye and wheat flour or it can be a heavy rye pumpernickel dough. The wheat dough can be made from a basic white flour dough, whole-wheat, or a sourdough. A layer of rye dough is placed on top of a layer of white (wheat) dough and the layers are rolled to create a spiral pattern of rye and wheat bread when baked. The crust is generally chewing and somewhat crispy, while the texture is fairly dense. 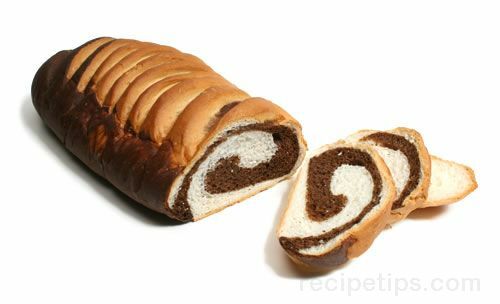 The addition of molasses gives the rye portion of the bread a distinctively rich flavor and dark brown color. Description: A type of rye bread with a lightly colored crumb and a chewy, but tasty crust. A small portion of caraway is often added to the dough to provide the bread with a bit more flavor. New York rye bread is a good accompaniment for soups and stews. Description: A type of rye bread of Polish origin that can be prepared with a number of different recipes. Lighter versions of Polish rye are similar in color, flavor, and texture to New York rye bread due to a generous portion of wheat flour added to the dough. Other versions of Polish rye are similar to the dark rye breads of other Eastern European countries and Russia and are made with a courser grind of rye meal. Many of the recipes for Polish rye bread, light and dark, feature caraway seeds, which provide additional flavor. Polish rye is excellent when served with hearty soups and stews. Description: A type of rye bread that is a bit lighter in flavor and texture than other rye breads of Northern Europe and Scandanavia. It has a soft crumb and is slightly sweet with a hint of molasses. It is often prepared as a loaf shaped hearth bread. Description: Wheat bread consists of a combination of enriched white flour and whole-wheat flour. Unlike whole-wheat bread that is made entirely of whole-wheat flour, wheat bread may contain more calcium, but less fiber than most whole-wheat varieties. Wheat bread has a finer texture and closer grain than whole-wheat varieties, especially commercially prepared and packaged varieties that are marketed as sandwich bread. 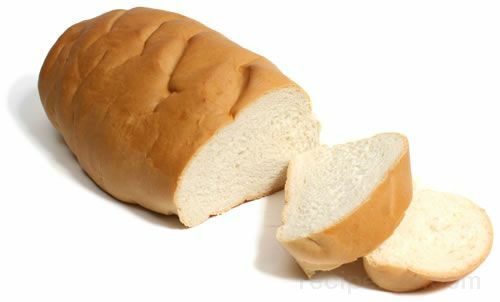 Description: White bread is one of the most popular bread varieties, especially in the United States. It is made with a basic yeast dough of wheat flour (usually all-purpose or bread flour). There are many types of white bread based on slight variations of the basic recipe. 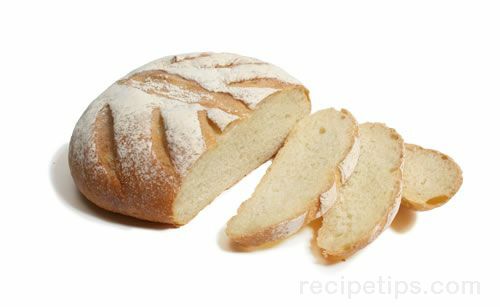 Most white breads feature a fine texture and close grain, which makes slicing easy. 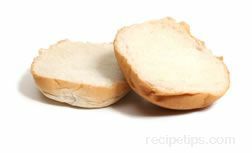 Commercially prepared white bread is usually sliced before packaging and is most often known as sandwich bread.